Art is magic… But how is it magic? In its metaphysical development? Or does some final transformation culminate in a magic reality? In truth, the latter is impossible without the former. If creation is not magic, the outcome cannot be magic. I used to buy anything that was unpainted wood at thrift stores. I guess I had an idea that I would decoupage and paint all of the boxes, trays and frames and make pretty shrines (and then sell them somewhere). Oups, that didn’t happen. I went on to other things, and life happened. 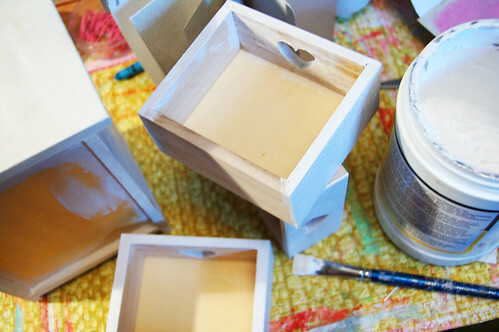 I’m not sure decoupage is really my thing… Though now I have a pile of stuff left, in a box somewhere. 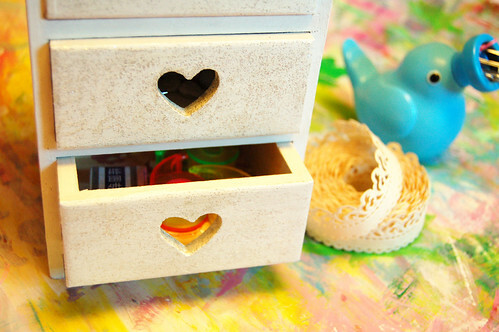 When I found this tiny chest of drawers (when organizing stuff around) I decided it was kind of neat, but in need of a coat of magic white paint. I decided it was craft time! 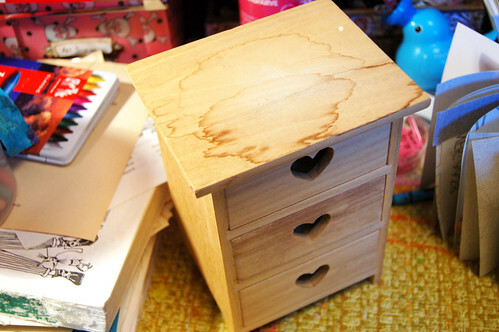 The wood is water damaged, but I think the heart drawers are still über cute. 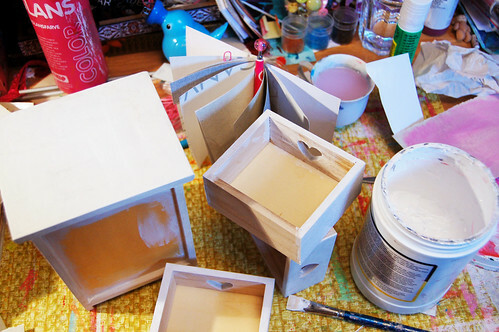 I covered the wood with one layer of gesso and then another layer of white acrylic paint. 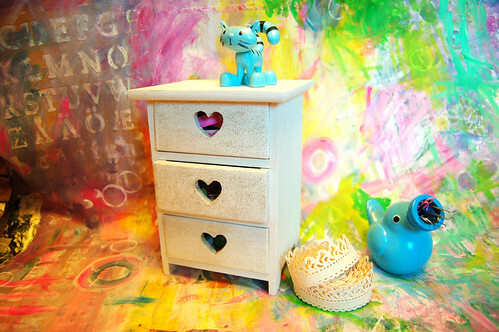 White paint is king when it comes to furniture renewal, even tiny furniture like this chest of drawers. White paint does magic to any furniture project, and I’ve transformed various projects before, like a tray, a huge frame (that I made into a inspiration board), a letter holder and a shelf and a chair! White paint, easy and beautiful. Plus, looks great in any space/room. Sparkle! I added glitter on the drawers, to spice things up a bit. What will you transform and beautify in the world this week? This entry was posted in A Creative Life, Home Comforts, Thrift & Recycle and tagged furniture, glitter, miniature, REpurpose stuff, thrifted, white. Bookmark the permalink. it’s so cute! beautiful job, hanna! 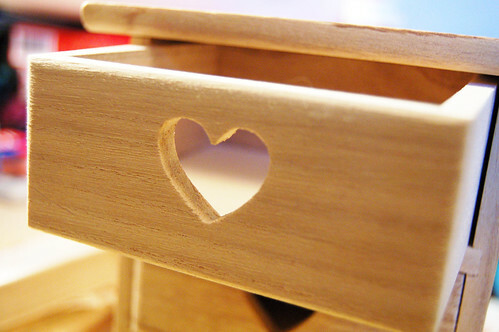 love the mini chest! and the pictures make it even cuter than it would be just sitting on a shelf in my house…fantabulous! I wonder why the German word ?ber- made it into international blog-speech. Very cute – I love the bits of pink ribbon peeking out ! I am working on purging and cleaning my studio armoire this week – big beautification which means I will actually be able to find things when I am looking for them !Yay ! 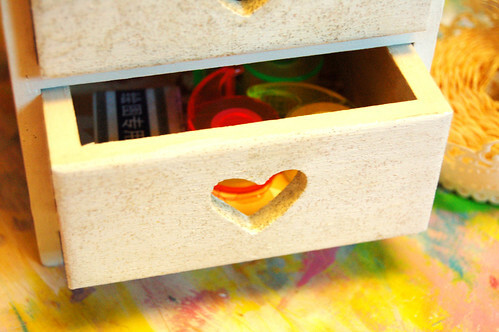 Enjoy your magic drawers !